Our party this weekend featured the popular blue and brown color scheme. 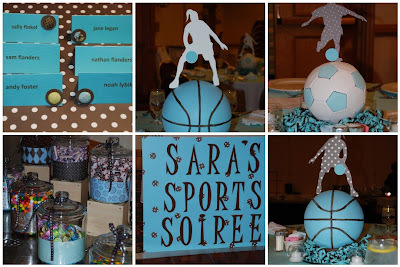 We created a candy buffet, custom sign, placecards with blue and brown button embelishments and centerpieces showcasing our bat mitzvah girl’s favorite sports. This entry was posted in Blue and Brown, Girls Sports Party, Sports Bat Mitzvah on March 21, 2009 by Setting the Mood.